If you have a baby you must need an item that gives your little one a playful, soothing and enjoyable environment when you need to free up your hands. In that case, the baby bouncer will be a perfect way to amuse your energetic baby, so that you can have a little break for yourself. But there are thousands of products in the market, which may or may not meet the safety and quality regulations. 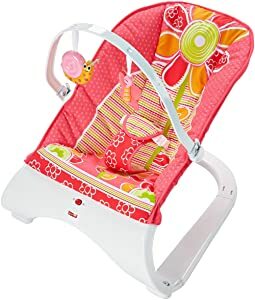 So how can you choose the best baby bouncer 2019 for your baby? Don’t worry, read the full article and you will be an expert in baby bouncer. Pretty cool, huh? Before going to read the full guide, check out the table below for an overview. What is the benefit of a baby bouncer? What is the difference between bouncers, jumpers, and swings? BABYBJORN Bouncer Balance Soft is designed for newborn to 2 years baby. This bouncer is very simple in design. With a soft and snug design, it is suitable right from baby’s day one. The ergonomic design also gives good support to your baby’s back, neck, and head. The bouncer comes with three adjustable seat positions – play, rest, and sleep. You can easily and quietly adjust the position from highest play position to the lower rest position and the lowest sleep position. 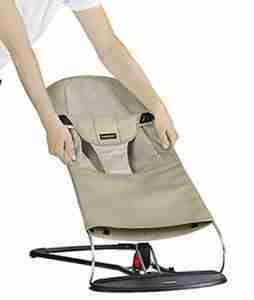 The bouncer is very lightweight and can be folded up flat when not in use. The bouncer has 3 padded safety harness & safety latches that ensure your babies 100% safety. The padded safety harness is also adjustable as your baby grows. Cotton: 100% cotton. Available in 5 different colors. Mesh: 100% polyester. (Black and gray) color available. Organic: 100% organically grown cotton. (Black and brown) Color available. All materials are free from harmful chemicals and allergens according to Oeko-Tex Standard 100, Class 1 for baby products certificated. The BABYBJORN Bouncer is gently rocked by you or your baby’s movements. No batteries are required. This enjoyable rocking helps your baby’s train and develop balance and motor skills in a natural way. The bouncer fabric seat is easily removable for wash. This bouncer also has toy bar attach system but you have to purchase the toy bar separately. The toy bar is also easily removable. Travel-friendly bouncer with (flat fold & lightweight). No vibration, songs and sound system available. If you’re looking for a cheap bouncer then Fisher-Price Deluxe Bouncer will be a perfect choice for you. Features like soft, plush fabrics give your baby extra comfort. A head pillow will provide head and neck support to your baby when they sleep. The head snuggle is designed like bunny ears shaped for a whimsical touch. The bouncer contains soothing music (8 sweet songs and nature sounds with volume control) that will entertain your baby and keep them busy. It also has calming vibrations options that provide extra comfort to your baby. You can control the vibrations and music volume level with the easy-touch buttons located on the control panel. The bouncer has 3 adjustable harnesses for your baby’s safety. It includes a toy arm with soft birds overhead the baby. You can also remove it easily for nap time or whenever you want quick access to your baby. The bouncer is very lightweight, so you can easily move it from room to room. The Non-skid feet feature of the bouncer ensures that it stays in place. The pad and insert are easily removable from the frame. They are also machine washable and can be tumbled dry on low heat. Several songs and sounds, vibrations available. Can not fold up the bouncer. If you want a bouncer for your baby sleep, then Sassy Cuddle Bug Bouncer is for you. This bouncer has a soft and comforting built-in cuddle blanket and offers an oversized cradling seat with newborn baby headrest. The wings of the bug are not only for show off. You can use them when your baby fell asleep. The wings are made of soft, jersey knit fabric that will keep your baby warm and cozy. The Cradling seat and newborn head support both are machine washable and tumble dry low for easy cleaning. The bouncer has 3 point harness for your baby safety. 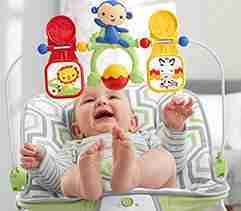 The bouncer also includes three developmental hanging toys (mirror, chime, and rattle) for baby’s entertained. The toy bar can be removed for nap time or easy access to baby. The bouncer also included 3 Soft vibration and 10 soothing lullabies that make the bouncer perfect for baby. You can also control them by using the easy touch control panel. Soft and comforting built-in blanket. Machine washable cradling seat and head support. 3 soft vibration and 10 soothing lullabies. No foldable system. So it is tough for you to trouble with this bouncer. If you’re on a budget and looking for a great bouncer that will last you, then the Fisher-Price Comfort Curve Bouncer will be great for you. Your baby can use this bouncer from his/her birth. The bounce is classic frame style with iconic colors. The curvy design of the bouncer gives back support to babies, especially to newborns. The bouncer has 3-point adjustable buckle restraint to keep your baby secure. When it’s time to play, an overhead toy bar helps to keep your baby entertain and stimulate. The toy bar is also removable. The comfy seat and calming vibrations of the bouncer give your baby a sense of security and happiness – almost like he’s cradled in your arms. The non-skid design keeps the bouncer in place. The bouncer is also machine washable. Difficult to removing and putting the toy bar in the bouncer. 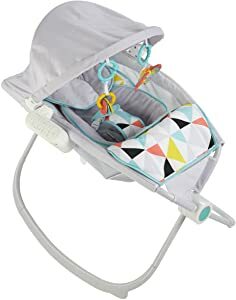 The Fisher-Price Geo Meadow bouncer has everything (inexpensive, light, simple, easy to use) that make it a favorite for babies and adults. It’s perfect for newborn through about four or five months of age. The bouncer seat will gently bounce on your baby’s natural movements. A press of a button adds calming vibrations, too. 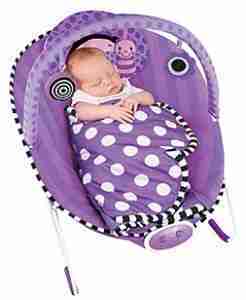 The optional calming vibrations and soft, cozy seat will help baby to feel safe and secure. The bouncer also has 3 removable toy bars (spinning monkey, lion and zebra toys). So when your baby fell boring in the bouncer an overhead toy bar will always entertain your baby. 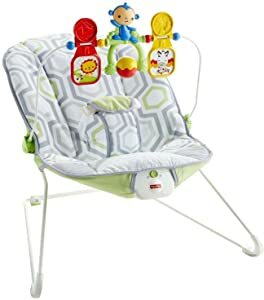 This bouncer is also very Lightweight and portable, so you can put it on the kitchen table, the floor by your bet, or even (as I did when my son was young) put it up on the bed next to you if your bed is against a wall! Of course, you can travel with it too. If you want an automated rocker that you can control remotely, I would recommend Auto Rock ‘n Play Sleeper with Smart Connect. It has two rocking speeds fast and slow – that will help put your baby to sleep. The rocking motion is gentle and quiet, even on the fast speed. It comes with a canopy that blocks out the direct light from your overhead lighting to provide a bit of shade for baby. The canopy also has 2 attachable toys and a light projection that appears on the top of it that will keep your baby happy for a short period. It has multiple options for the vibration, rocking, and music. There are control buttons on the side that you can use to play music melodies, turn on the adorable projection of animals, adjust the rocking speed, sound volume, and to vibrate the rocker. With the smart connect technology, you can easily pair with a smart device using Bluetooth with their app and control every setting from the palm of your hand. It is also very lightweight and can be folded up in half by pushing a button so you can easily store it out of the way when not in use. The fabric is also very soft and removable which makes it very easy to wash. The design is slim and sturdy. You can use all the features independently, for example, if you wanted lights but no music. So you can only turn on the light while the music is off. You able to use it with batteries or Plugs into an outlet. Newborn padding insert for little babies that can be removed as they grow. You can control the rocker through an app on the mobile phone. Many users complained that the bouncer making a loud clicking noise. One extremely apparent benefit of using a baby bouncer is that it gives you the time to free up your hands. If you are a new mom you may be so busy with holding and carrying the baby to sleep that you don’t have enough time for yourself. In that case, having a baby bouncer it would allow you to have a breather while letting the bouncer seat rock your baby to sleep. The baby bouncers are also very lightweight; you can move them around the house with ease. When you are going for a bath you can take the baby into the bathroom or in the kitchen with you. So you can see them at all times, while you get what you want to do. Baby swings: Baby swings work just like normal swings do! Some swings back and forth without the need of your baby to move. Baby Jumper: use the movement of your baby’s feet when they push or jump themselves up from the ground. Baby bouncers are products that you can buy for your baby to relax and play in when you are busy and need to carry on with your daily chores. But with so many products on the market, it’s hard for you to choose the best baby bouncer for your baby. However, there are some things that you need to know before buying a baby bouncer. Padding: It is important to look that the bouncer you are buying is it comfortable for your child. Many bouncers have a padded seat that can help to keep your baby comfortable as he bounces away. Easy to clean: A machine washable bouncer seat can make your life much easier. So look for something that has a cloth seat that is easy to remove for washing reasons, and also a waterproof fabric that is easy to wipe down. Head support: A head pillow will provide head and neck support to your newborn baby when they sleep in the bouncer. Recline seat: An adjustable reclining seat will give your baby more comfortable. The seat will be adjustable according to your baby growth. Wide Base: When deciding on a product, you need to look for one that has a wide base. This is because if it has a large base, it will be toppled or fall over with your baby. Foldable: A foldable bouncer can be very useful for traveling and small houses. Whenever you do not use the bouncer, you can easily fold up and store it. Non-skid: Slipping is a big problem on smoother floors like wood or tiles. Many bouncers have a non-skid pad that helps to keep the bouncer in place. Safety Harness: When buying a baby bouncer, you need to determine how secure your baby will be. Make sure that the baby bouncer you buy has a harness system to stop your little one from falling out. A 3- point harness system (one between the legs and one on either side) minimum needed to keep your baby secure. 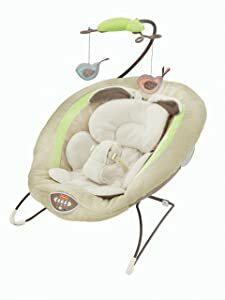 Weight capacity: The type of baby bouncer seat that you are going to buy for your baby will depend on quite a bit of the weight of your baby. Some baby bouncers are designed only for very young babies, so make sure you buy something that you can use long term. 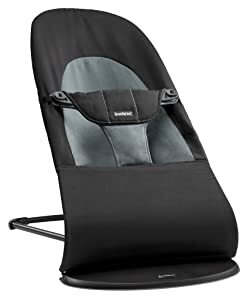 Sunshade: If you want to use your baby bouncer near a window or outside then purchase a bouncer that comes with a sunshade. It will help you to save your baby’s delicate skin from burning while bouncing. Toy bar: Most baby bouncers come with a toy bar for the baby to reach out and grab. Some toy bars are attached permanently to the baby bouncer while others can be removable. Music and sounds: Music is an extra bonus for you. Some baby bouncers have a variety of different tunes music and sound. That can be played while bouncing. It gives your baby extra entertainment. Vibrating seat: A vibration seat provide a great comforting motion for your baby. It also helps your baby to sleep. It is great for newborn babies who do not know how to bounce the seat. Themes: Each bouncer has their own theme. A bright and colorful bouncer theme will be interesting to your baby girl. But it may not be interested to your baby boy. Your baby boy may be like car or truck theme bouncer. So choose a theme according to your baby’s choice that will help to enhance their enjoyment in the bouncer. While baby bouncer is generally not a dangerous product for your baby, but it can be dangerous if you do not use the product properly. Let us take a quick look at a few safety precautions that you should follow. Each baby bouncer has their own recommended weight. Make sure that your baby does not use the bouncer if he/she is beyond the limit already. This may lead your baby to unnecessary accidents. It is always important for you to find a safe place to set up your baby bouncer. Make sure that the place you choose it is flat and free of clutter. Do not use the bouncer more than 45 minutes at times. Want to know more safety guide for the baby bouncer. Check this baby bouncer safety guide. 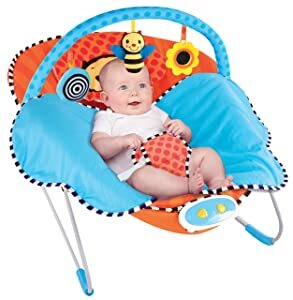 Found the best baby bouncer 2019 for your little one? Let me tell your experience about baby bouncer. You can also share this article with your friends to let them know about the best guide on the baby bouncer.